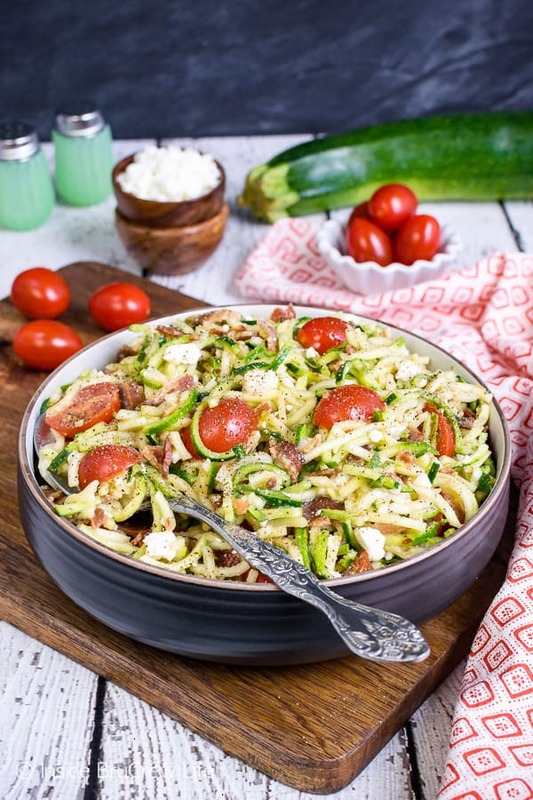 A bowl of this easy BLT Zucchini Salad is a delicious side dish to add to all your summer picnic and dinner plans. 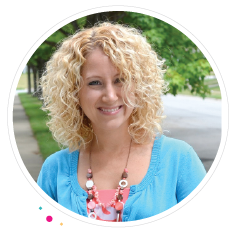 You are only a few ingredients away from enjoying a healthy low carb salad for dinner tonight. Zucchini is officially my favorite veggie of this summer. It happen to be one of the most versatile veggies too. 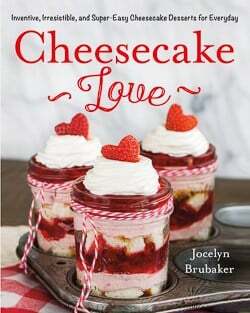 You can enjoy it in sweet or savory recipes. 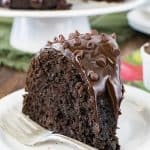 Now I usually adore the green veggie hidden under layers of chocolate like in these Frosted Zucchini Brownies or in a loaf of Chocolate Chip Zucchini Bread. But this year eating shedded or spiralized zucchini in a healthy green salad has been my go to way of using up the zucchinis I keep buying. The flavor and texture of raw zucchini is delicious. It actually absorbs the salad flavors so well this way. This summer we have had this Healthy Pizza Zucchini Salad and these Parmesan Garlic Shrimp Zucchini Noodles more times than I can count. And I would still eat them if you put it in front of me. Both recipes are so yummy! When I think about summer food though, one of the first things that comes to my mind is a BLT sandwich. Since we are trying to limit the amount of unhealthy carbs that we consume this year, bread isn’t on my list of foods to eat. Thankfully the extra zucchini in the fridge came to the rescue!!! It’s an easy way to add the classic summer sandwich flavors to a healthy low carb side dish. 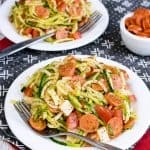 Use a spiralizer to create noodles from two medium zucchinis. 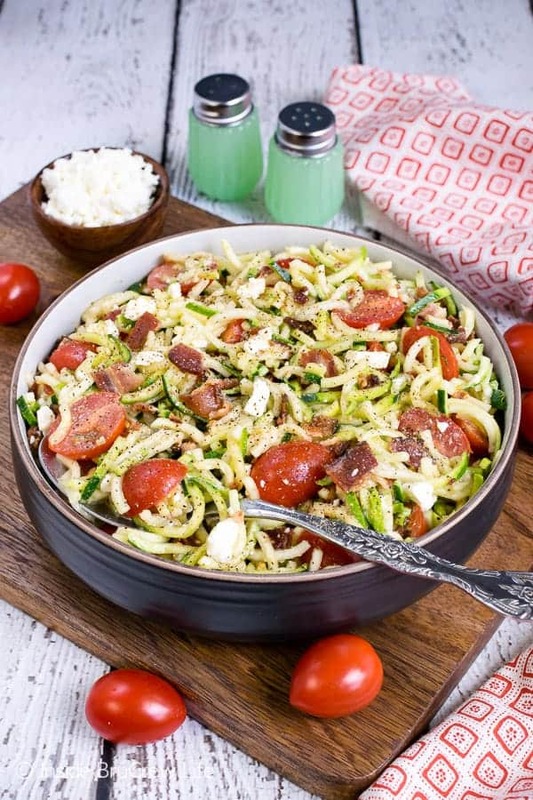 Then use a knife to chop the zoodles into smaller pieces before adding the rest of the ingredients. A medium sized grater also works well. Whisk together some olive oil and vinegar and pour over the zucchini. Toss to coat everything. Add some halved cherry tomatoes and crumbled feta cheese and season to taste with salt and pepper. 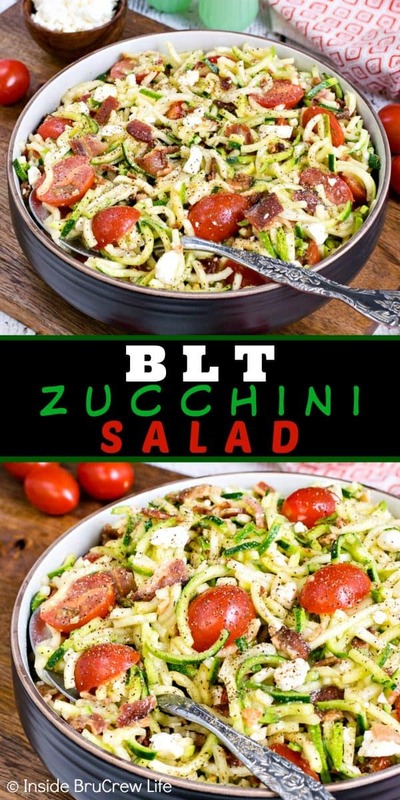 Refrigerate the BLT Zucchini Salad at least one hour, so that the zucchini absorbs the flavors and softens up slightly. Right before serving stir in the crispy cooked bacon. 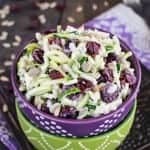 This Cranberry Zucchini Slaw is an easy and refreshing salad. 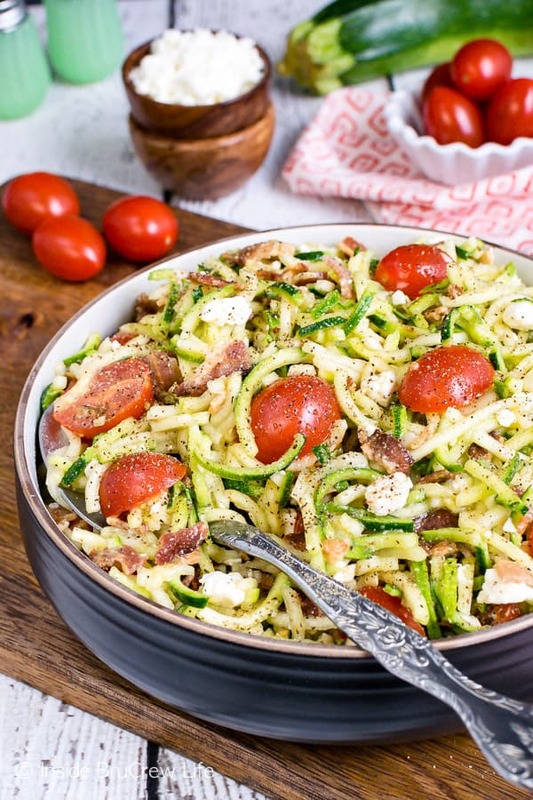 The nuts and berries add a delicious sweet and salty twist to the shredded zucchini. Slice up your zucchini and cook it with this Sheet Pan Chili Lime Cod dinner. The spicy rub adds such a great flavor to the fish. Keep a batch of these Spiced Zucchini Oatmeal Bites in the fridge for grab and go breakfasts or snacks. 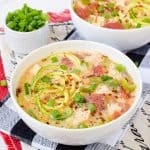 A bowl of this Zucchini Tomato Italian Sausage Soup from A Family Feast is a delicious way to use up all your garden veggies. 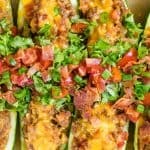 These Baked Zucchini Fries from Cookin Canuk are a delicious way to enjoy crispy food without the guilt. 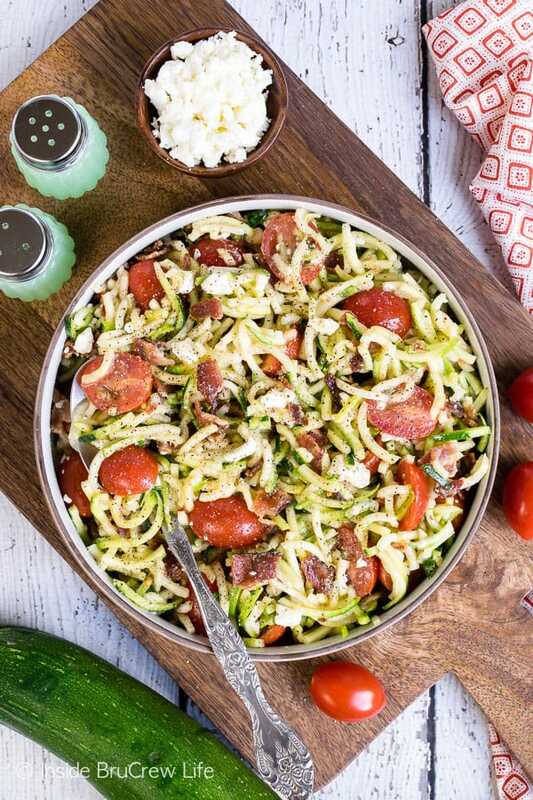 This easy BLT Zucchini Salad is a delicious dish to add to summer picnic and dinners. You only need a few ingredients to make this healthy green salad. 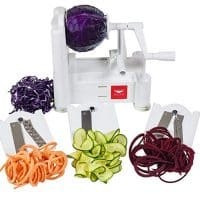 Use a spiralizer to create noodles. Chop the longer noodles into smaller pieces. Whisk together the oil and vinegar and toss with the zucchini to coat. Stir in the tomatoes and cheese. Season the salad to taste with salt and pepper. 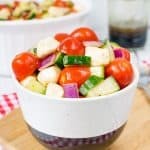 Refrigerate the salad for at least one hour so that the flavors meld and the zucchini softens slightly. Right before serving stir in the crispy bacon. 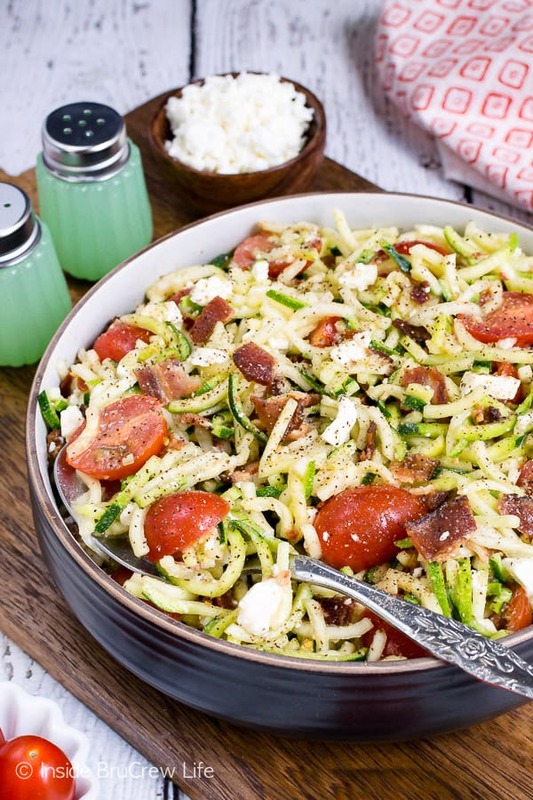 *You can also use a medium grater to shred the zucchini into short pieces if you do not own a spiralizer.